hhaha nah this is me and feriohhhhhhhhhhhhhhhhh thread lmao..
yeha..go play with it! how much the install gonna run ya!!? btw.. SSR has some wheels that are blue lip with red center.. chop that! Last edited by IrockCivics; 05-05-2007 at 05:07 PM. Last edited by Em2onCPRs; 05-06-2007 at 03:04 AM. damn are u really bored with your car? haha if anything u should go with a dark red or something.almost burgundy color. but i can imagine some nice takata green te37s now that u show ur car with some green works haha. 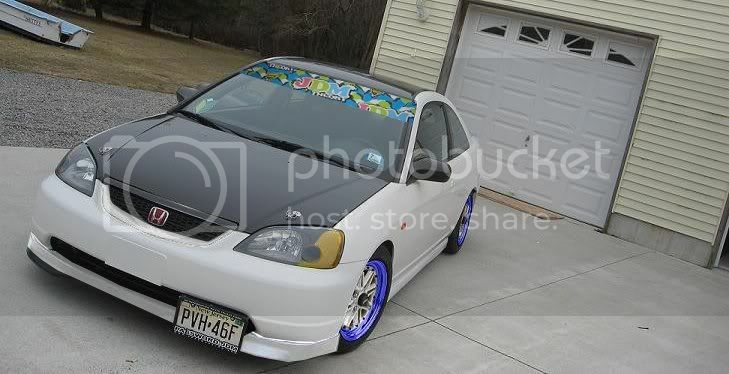 get the Mugen rims! cant go wrong! at least your car looks nice! ha ya its was temp while i was welding my muffler to my axleback.. which im now trying to trade for something smaller so i can pull into my drive way lol..
sumone trade me something small for my apexi n1 turbo axleback!